Some All Star break frivolity. Cal State, four times lofting air balls at an orange basket that may as well have been painted invisible. The infamous sing-song chant that now follows an air ball seems to have developed later in the decade. Duke fans (who else?) claim to have begun the first "air ball" chant in 1979, following a miss by North Carolina's Chick Yonakor. The chant itself has been the subject of academic research. In a 1992 paper entitled "Air Ball: Spontaneous Large-Group Precision Chanting", researcher Cherill P. Heaton noted the chant invariably begins on the note F ("AIR"), and ends on D ("BALL"). And that this happens spontaneously and "without direction, instruction, a conductor or a pitch pipe". Heaton's research was popularized in a 1995 Dave Barry column, in which Barry, inspired by "TV documentary series The X Files", concludes the chant is the result of radio waves sent by extraterrestrials. While the air ball is firmly entrenched in the culture of basketball, it is not, sadly, tracked as an official statistic. In this post, I will attempt to remedy this glaring omission from the box score, using SportVU motion tracking data and some freshman level physics. The SportVU motion tracking system tracks the court location of all 10 players. In addition, the ball itself is tracked in all three dimensions. Building upon my previous research on shooting arcs, we can use this data to identify air balls. A search for an air ball is a search for purity. An air ball's trajectory is clean and parabolic, unmolested by rim or backboard. My code hunts and pecks through the mess of SportVU data points until it finds these pristine Newtonian arcs, and then matches them back to the play by play data and the player that took them. A key caveat for all that follows is that this data is incomplete. SportVu data is often messy, and at times just missing. I can only reliably identify some 60-70% of shots, and that varies significantly by arena. Oracle Arena, where the Warriors play, has particularly messy SportVu data. My hit rate for those games is less than 50%. In addition, for the current season, I do not have any games played beyond January 23, 2016. The NBA, for reasons unknown, has stopped sharing the detailed player tracking data publicly (and the nifty animations that once accompanied each play). 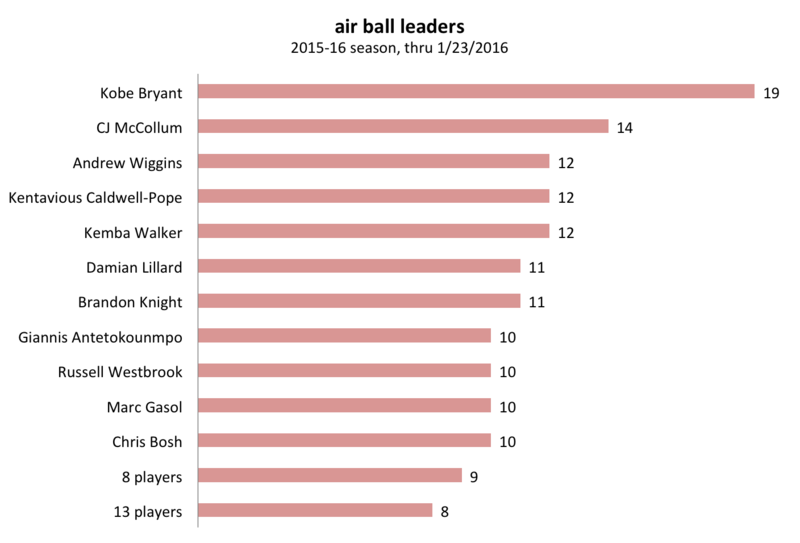 By my count, Kobe has chucked 19 air balls this season, 5 more than the next player on the list, CJ McCollum. While not exactly a storybook ending, there is a symmetry in Kobe's struggles this season. 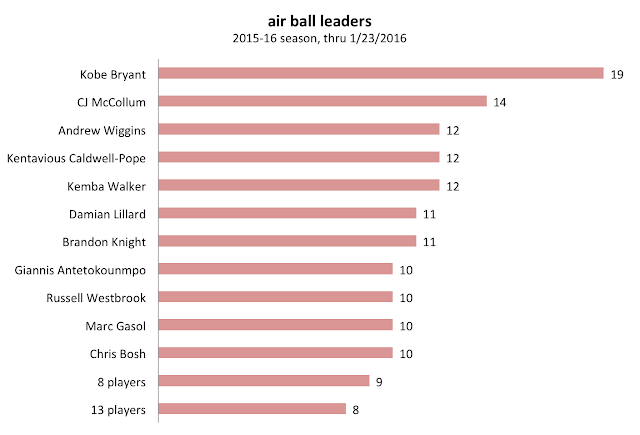 Bryant's career began with the air ball (born in it, molded by it). In game five of the Lakers 1997 semi-finals series against the Jazz, Kobe Bryant, in his rookie season, shot three straight air balls in the final minute of overtime. The Lakers lost the game and the series, Shaq provided some words of encouragement(! ), and Kobe the fearless shot taker was born. 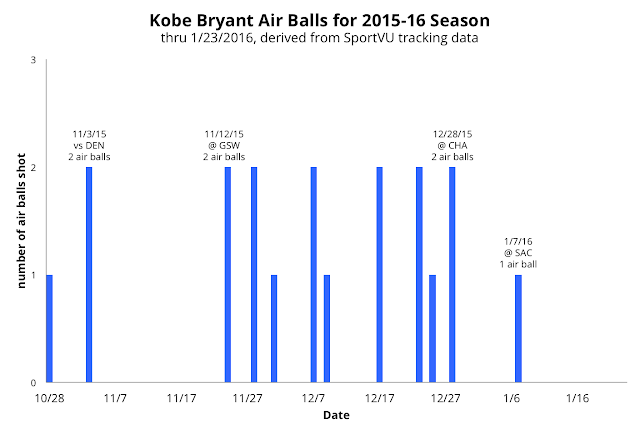 Here are Bryant's air balls charted over time. 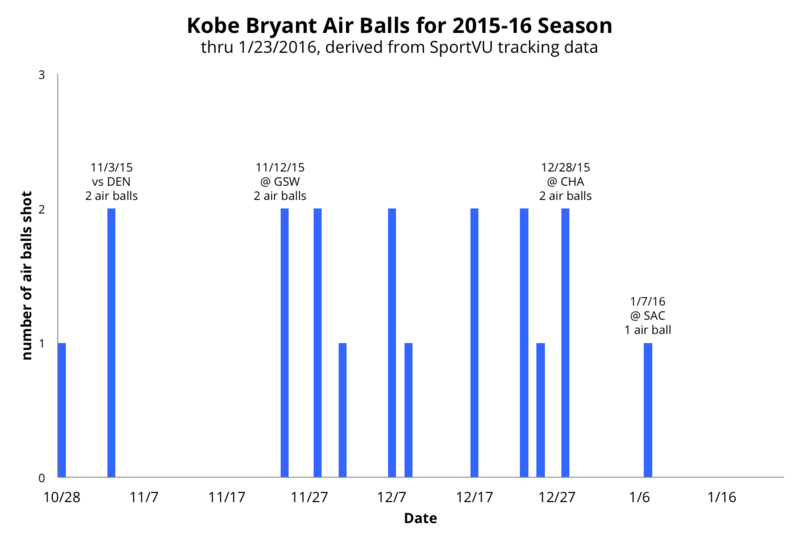 Bryant had a particularly brutal stretch starting in late November and continuing through December. 15 of his 19 air balls came in that 35 day span. For shots that I can measure, Kobe has air balled 4.6% of his field goal attempts this year. This is more than twice the league average air ball rate of 2.2%. Most of his air balls (13 of 19) have come from three point range, which isn't too surprising. 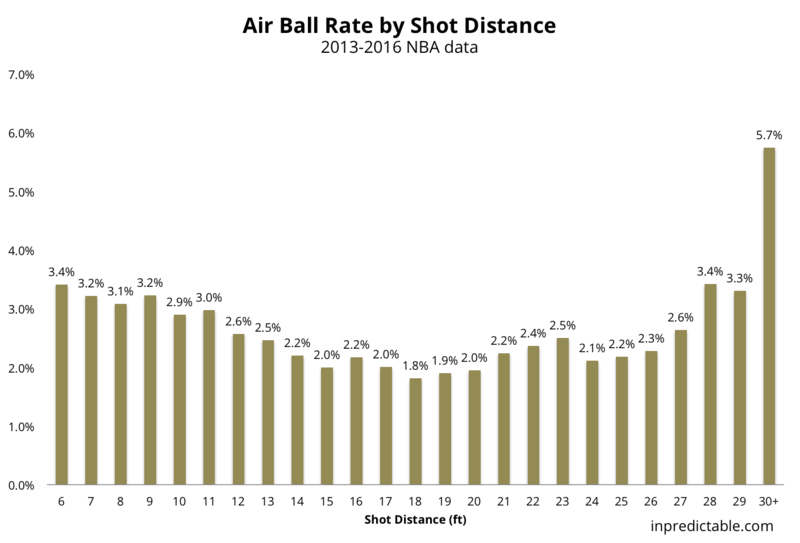 However, air ball rate by shot distance is more consistent than I thought it would be. The distribution is bowl shaped, with higher rates at short and long distances, and the lowest air ball rates in "mid-range jumper" territory. 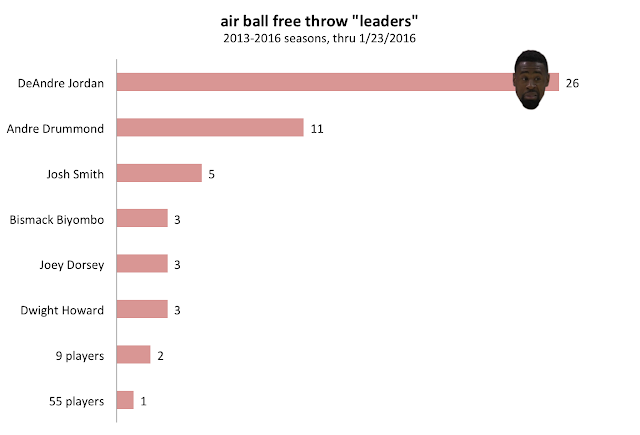 With an overall air ball rate of 2.2% for field goals, one would expect to see a couple in any given NBA game. But an air balled free throw occurs far less often - about 0.1% of the time (once every thousand attempts). Over the past three seasons, which players have shot the most air balls from the free throw line? There are times when new data can surprise you, and cause you to re-evaluate long held positions. This is not one of those times. Perhaps the only thing surprising about this result is the wide gap between DeAndre Jordan and Andre Drummond, the two worst free throw shooters in the league. Jordan's free throw percentage is slightly better than Drummond's over this time span, but his air ball rate is twice as high. He shoots an air ball on 2.7% of free throw attempts, compared to 1.3% for Drummond (recall the league average is 0.1%). A big thanks to ESPN's Tom Haberstroh for planting the idea for this post. It turned out to be a successful nerd snipe. Are there "shooter friendly" NBA arenas?